ReDot Fine Art Gallery is proud to welcome a very special exhibition of barkcloth art from the Ömie artists of Mount Lamington in Oro province, Papua New Guinea. An artistically groundbreaking event for ReDot Fine Art Gallery, this exhibition has allowed us to extend our sights to include work which looks beyond contemporary Indigenous Australian art, and to indigenous art in the broader Australasian region. This exhibition is a major coup for the lion city, it is only the fourth ever exhibition of art from the Ömie artists, and the first ever outside of Australian shores. We are privileged to be able to bring these tribal customs to Singapore and allow all Singaporean's a rare, personalised, insight into this ancient, yet dynamic and blossoming artistic movement. Powerfully tactile, the barkcloths or nioge which feature in this exhibition, No si hijomiono’o jabesi sor'e jajivo - (We are painting the designs of our ancestors), are made from thin veils of beaten paper mulberry tree bark, which are then painted in an earthy palette of colour made from bush dyes. Traditional customs dating back many centuries are still used today, as these dyes are painted onto the material using painting sticks and brushes fashioned from a variety of rainforest plants. Both traditional motifs and original visual expressions of ancestral Ömie knowledge adorn the artworks which are still used in both ceremonial as well as practical contexts, such as clothing. Created by senior Ömie tribeswomen, the nioge are the outcome of a long period of apprenticeship. Within their respective marital and birth clans, females learn the techniques and customs which lead to the production of these beautifully crafted, spiritually rooted artworks. For the Ömie, the practice of making barkcloths originated from the time of the ancestors. Their creation story tells of how Mina, the first man, instructed Suja, the first woman, to beat and dye the first barkcloth. For centuries Ömie women have been painting designs onto barkcloth, however, many of the designs are also derived from the ujawe, the somewhat painful Ömie initiation rite involving the tattooing of clan insignia onto skin. 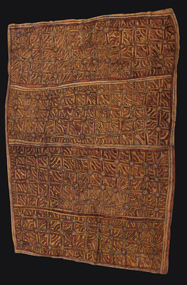 Contact with Christian missionaries in the mid twentieth century heralded a cultural shift in Ömie practices, and contributed to the transference of these designs from the skin and onto the barkcloth. Now, particularly when worn as clothing, the nyog’e forms a sort of ‘double skin’, which constitutes something of an artistic armour for the retention of traditional Ömie knowledge and cultural practice. Place, art and culture are all synonymous for the Ömie. The creation of the nioge is an affirmation of culture and an essential reminder of the power of nature over human life. The Ömie villages sit precariously on the steep slopes of the volcanic Mt Lamington, and so a reverence and respect for nature in all its might has evolved as an intrinsic part of these people’s lives throughout the ages. Artwork which palpably speaks to us about maintaining deference for the natural world seems to be a highly pertinent sentiment, irrespective of where in the world we live. One of the most unexplored and untouched regions in the world, this area has an exceptionally diverse range of traditional cultures which remain very much living as they always have. Both Singapore’s and Australia’s proximity to the Pacific and Papua New Guinea has generated growing curiosity and interest in researching and collecting Oceanic art. To this end, this first ever Singaporean, and international, exhibition of Ömie barkcloth serves to give insight into the visual cultures from the Australasian and Pacific regions, providing an international platform for the Ömie people, for whom producing these artworks is a means to cultural, social, political and economic empowerment. The crucial income generated by these stunning artworks contributes to the development of sustainable infrastructure in the region, such as schools and medical care. Like many Melanesian tribal cultures, the Ömie have highly complex social and religious beliefs steeped in tradition, but they are also dynamic and responsive to the growing need for cultural and artistic conversations with the world outside of their tiny, remote villages. We are thrilled to welcome these works into our gallery.